Ireland face the Scots on the first weekend of the tournament. 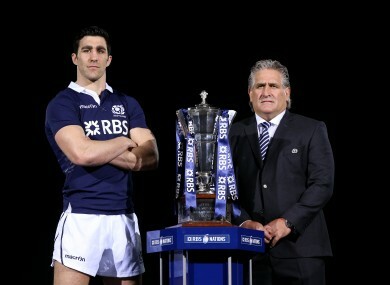 Scotland captain Kelly Brown and head coach Scott Johnson. SCOTLAND CAPTAIN Kelly Brown is confident a once debilitating stammer will have no bearing on his ability to lead the side in this season’s Six Nations. The 31-year-old Saracens flanker still puts himself through a routine of daily early morning breathing exercises in a bid to get on top of the problem. While traces of his condition remain evident, Brown had no trouble making himself understood at yesterday’s Six Nations launch in London, having hit something close to rock bottom in 2010. Indeed his most pressing issue ahead of Scotland’s tournament opener against Ireland in Dublin on 2 February is retaining the No 7 shirt in the face of competition from Chris Fusaro, with coach Scott Johnson saying form, not rank, will seal Brown’s place in the starting side. “I find I don’t stammer when I shout, and I tend to shout quite a lot on the pitch,” Brown said. “I know it’s part of me and all of the players know it’s something I’m working on. “It’s something I will continue to work on and I work on every single day. I get up in the morning and I do my breathing exercises. But I know if I can do that and I can put in the work, I know that most of the time I’ll be in control of my speech. “In the 2010 Six Nations I was asked if I could do an interview right at the start, and it was so bad that I actually phoned and asked if that interview could never be shown. That was really the final straw, I said, ‘right I need to do something about this’. An admiring Johnson added: “I’ve been asked what inspires me, and it’s people who overcome some kind of adversity. This kid’s an inspiration, to do that. “It’s not a massive adversity compared to others, granted, but to stand up in front of people every day and for him to speak, that inspires me, it’s a good thing,” the Australian explained. Johnson, using a typically vivid phrase, said he was keen to increase Scotland’s playing depth during the Six Nations if he possibly could, but not at any cost. “We’ll always make sure they are equipped to do it physically: we don’t want to go to a gunfight with a water pistol,” he said. Email “Speech stammer won't stop Kelly Brown leading Scotland's 6 Nations bid”. Feedback on “Speech stammer won't stop Kelly Brown leading Scotland's 6 Nations bid”.